This introduction to the night sky is for amateur astronomers who desire a deeper understanding of the principles and observations of naked-eye astronomy. 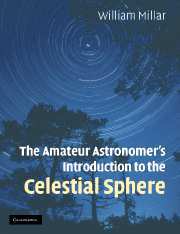 It covers topics such as terrestrial and astronomical coordinate systems, stars and constellations, the relative motions of the sky, sun, moon and earth leading to an understanding of the seasons, phases of the moon, and eclipses. Topics are discussed and compared for observers located in both the northern and southern hemispheres. Written in a conversational style, only addition and subtraction are needed to understand the basic principles and a more advanced mathematical treatment is available in the appendices. Each chapter contains a set of review questions and simple exercises to reinforce the reader's understanding of the material. The last chapter is a set of self-contained observation projects to get readers started with making observations about the concepts they have learned. William Charles Millar, currently Professor of Astronomy at Grand Rapids Community College in Michigan, has been teaching the subject for almost twenty years and is very involved with local amateur astronomy groups. Millar also belongs to The Planetary Society and the Astronomical Society of the Pacific and has traveled to Europe and South America to observe solar eclipses. Millar holds a Masters degree in Physics from Western Michigan University. 1. The lure of the sky; 2. Location and coordinates; 3. Stars and constellations; 4. Motions of the Earth; 5. The seasons; 6. The phases of the Moon; 7. Eclipses; 8. Observation projects; Appendices.